The cranberry-madness still has a hold on me. I seriously can't enough. Anytime time I make something, I stop to wonder if cranberries would go well in it. Over the years, I've always had at least two or three bags of cranberries in my freezer at any given time. Right now I have zero, and it's making me a little uneasy. I'm worried that next time I go to the market, they'll be all gone—that I'll have missed my chance for the season. Since that hasn't happened yet, I'm just gonna go with the flow. So, you know how Food Network Magazine has those awesome little inserts every month? They have titles like "50 Pies", "50 Potato Salads", "50 Super Bowl Snacks", "50 Smoothies", "50 Things to Make with Bacon"... those may be my favorite part of the whole magazine. I have a ton of them (okay, not a ton—but at least 27) stacked on my working bookshelf. They full of great ideas and inspiration. You probably know where I'm going with this. Yes, there was one on cranberries. It was in the November '14 issue, and titled (surprisingly) "50 Things to Make with Cranberries". I'm thinking of trying all 50. Maybe that will make my little obsession disappear. 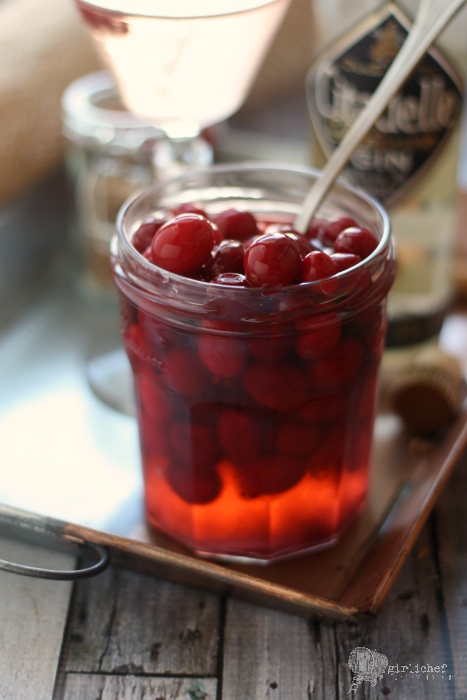 Today, I'm checking two off the list—pickled cranberries, and the cocktail that they tumble perfectly into. At first glance, this cocktail (and the pickled cranberries themselves) can be deceiving. My brain associates the plump crimson berries with a tart-sweetness. These are entirely savory. Sweet cocktail drinkers may not enjoy this, but those who like a good savory cocktail will (think Martini or a regular Gibson). A simple recipe for pickling cranberries, that you can then use to make yourself a cocktail (a Dirty Cranberry Gibson). Combine water, sugar, vinegar, salt, coriander, and crushed red chile flakes in a small pot and bring to a boil. Stir to dissolve the sugar and salt. Put the cranberries in a jar and pour the boiling liquid over them. Allow to cool to room temperature, then seal and refrigerate for at least for hours. Store covered in fridge. Combine 2 ounces gin, 1/2 ounce dry vermouth, and 1/2 ounce of the pickled cranberry brine in a cocktail shaker with ice; shake until cold. 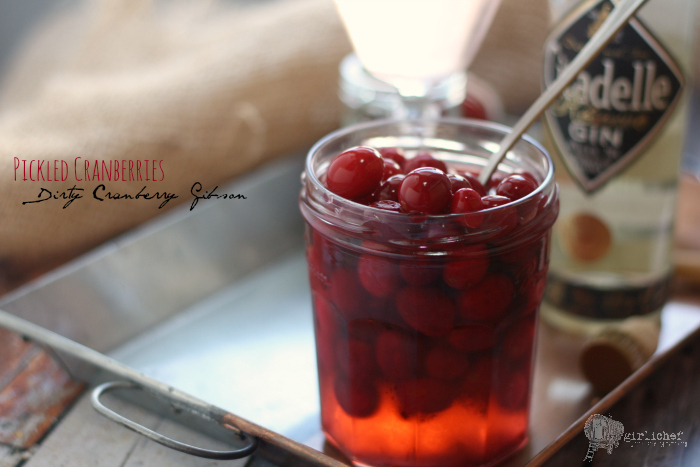 Strain into a glass and garnish with a few of the pickled cranberries.